For many years I never wore necklaces because they tangled in my hair and it hurt to yank them out. Then as fortune would have it I tortured my hair for over a year (bleach, perms, dyes - you name it, I did it) until it decided to quit my head. After that I promised myself I'd take better care of my hair when it grew back. And so 12 months later, once I had hair again, I bought a hairbrush and brushed my hair for the first time in a decade. Lo and behold I discovered one can wear necklaces without pain when one brushes one's hair regularly. 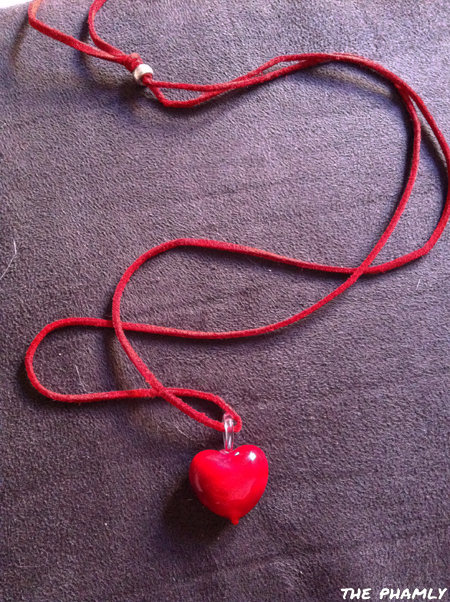 That's when I bought this murano glass red heart necklace on eBay around the time I got my cougar necklace! It comes on a red leather cord and is oh so '90s. I lurrrve it.